Tallinna Pühavaimu kiriku torn sai 2002. aasta tulekahjus tõsiselt kahjustada. Pärast põlengut tekkis praegusaegse restaureerimise filosoofilist poolt analüüsides küsimus, kas torn vajab tagasi tornikiivrit, millest pea midagi ei säilinud. Säilitasime kiivri algne kuju, rahuldamaks nostalgia-himulisi, kuid kiivri ehitasime plastikmembraanist, mis pingutatud fiiberkarkassile. Torn saaks olema elav ja silmatorkav märk linnaruumis, mis muudab oma värvi vastavalt kirikupühadele ning kuju vastavalt ühiskonnas toimuvatele muutustele. 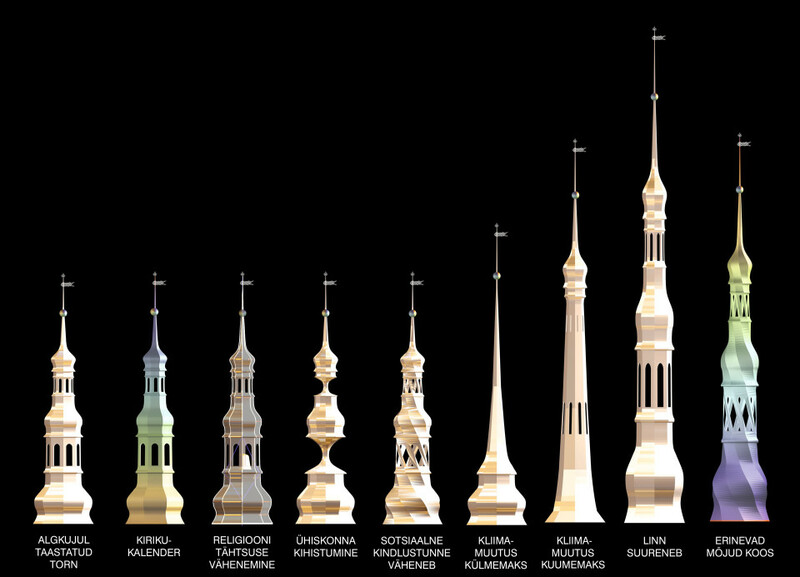 The spire of Tallinn’s Church of the Holy Spirit was damaged by fire in 2002 and most of its elements were destroyed. The Church of the Holy Spirit was built in the 14th century and is the only sacred building in Tallinn that has preserved its original shape. After the fire rose a question: does the tower need the old spire at all, of which nothing original remains exept for 1/3 of the structure and the knowledge of its form? This was a tough question to comtemporary restoration philosophy. The project proposes basically the same old shape of the spire to satisfy the nostalgic needs of people, yet it is an entirely new contemporary structure of a plastic membrane streched over a fibre carcass to form the body of the tower. 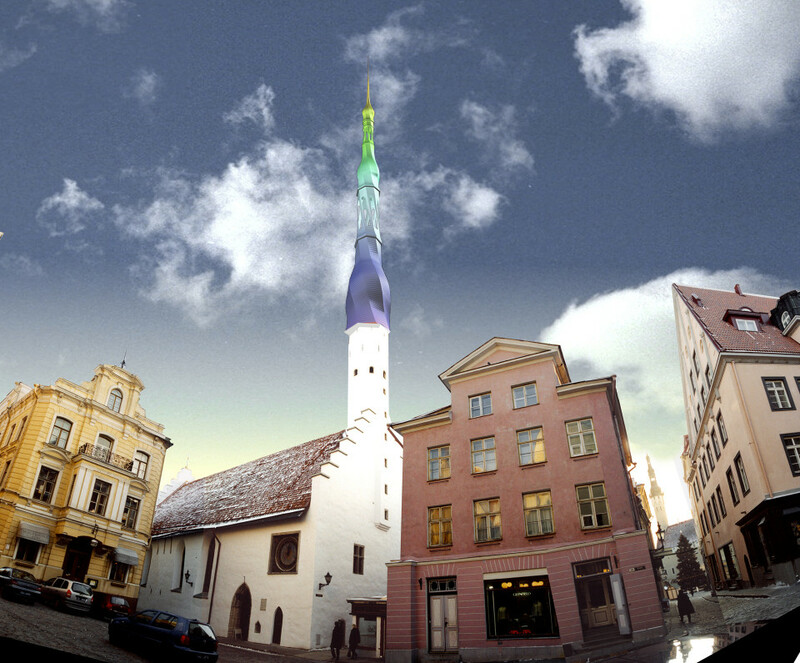 The tower design is a vibrant eye-catcher in the city space as it changes its colour according to church holidays and its shape according to changes taking place in society. It thus changes from day to day as well as in the long term. The factors of its changeing are for instance the growth of Tallinn’s population, climate changes, unemployment rate of Tallinn residents etc.